It’s news to no one at this point, but it bears repeating: Amazon has a way of making life easier. Prime especially is great for businesses. Subscription purchases for supplies the office needs regularly, like paper towels, trash bags, paper clips, and dozens of others, make for one less thing on your to-do list. Amazon Fresh is great complement to Prime for hooking you up with healthy office snacks, like fresh fruits and vegetables. At only $14.99 a month when added to your Prime subscription, it’s well worth it for the time you save. You can also try it free for 30 days if you have a Prime membership. 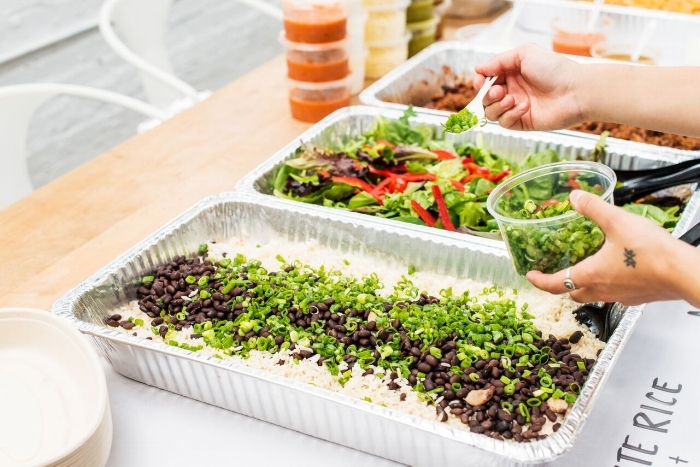 Your employees know that nothing beats free food, and corporate caterers are a great way to reward your team for being their awesome selves. Sifted, in addition to guaranteeing a tasty lunch, has the added benefit of being easy for you. No need to remind teammates to submit their orders; you set up your Sifted lunch program on a recurring schedule, and the rest is handled for you. Their team of chefs plans the meals according to your team’s dietary restrictions and preferences, and everything’s prepared in-house with fresh ingredients. They deliver the food to you and set it up in the office, ready to serve. They handle everything all the way down to the cleanup; all you have to do is show up hungry. Managing expenses can be a pain, but Expensify takes the work out of it. It eliminates the need for manual data entry, making it a great resource for company card management, business travel, and expense reporting. SmartScan means you no longer have to carry around a bundle of receipts in your wallet: you snap a photo of the receipt with the built-in camera function and the app keeps track of it. The easy to use mobile app means your team can stay on top of expenses and not spend hours of time trying to find receipts and remembering what a credit card charge was for. Next-day rapid reimbursement also makes life a lot easier. Expensify automates every step of the process and saves you messing around with spreadsheets. A communication hub with a sleek, straightforward interface, Slack messages are a great way to communicate quickly, especially in remote office cultures. Instant message anyone in your company from the desktop site or the downloadable app, and divvy up channels according to projects/teams. Save your emails for the important stuff and declutter your inbox by using slack for the conversations that don’t need to be saved. Slack isn’t new to most though. The real hint here is about slack integrations. There are 1000’s of integrations that can help make your life easier. We like simple poll to help take a quick office poll, so you can figure out what t-shirt design everyone likes best or what restaurant should be for lunch today. Giphy is also a great integration that makes it easy to quickly add a GIF and add some humor in the office place. Last but not least, Zapier is another great integration that can help connect many other apps. We use Zapier to send a notification to slack when a new image is uploaded to google drive. Plan everything business travel-related on one website. No, seriously, everything: commercial flights, charter flights, train rides, hotel bookings, Airbnb spots, all of it. The service searches hundreds of travel websites and digs up the best offers on flights or hotel rooms for you to compare. Save yourself a lot of work, a lot of money, and a lot of time tearing your hair out on the phone with airline customer service. For all the extra jobs that need wrangling-- cleaning services, IT support, maintenance and repairs, etcetera-- there’s Eden. This competitive services marketplace gets you multiple bids on any job that needs doing around the office, and they handle all the onboarding. Additionally, all your services are lumped into one bill from Eden.io, so you only have to worry about one invoice at the end of the month. Vendors are recommended by other office managers in your city, so you know you’ll be able to have confidence in a vendor before committing to them. Your main job as an office manager is to make life easier for everyone; why not start with yourself? Knowing the best tools that are out there for streamlining office day-to-day is the first step to building an organized culture for the whole company. Do you have any tips, tricks, or resources that you have found helpful? Let us know in the comments.